my name is Felix and I live in Germany. I have been part of the MWG-Community for a few months now, but I never really looked into the forum much. But today I did and found #theweeklypaint, and since I really like the concept, I am starting my own thread. A little bit of background would be best first I think, to understand my "goals" for this year. I started collecting and playing WH40k about 2 years ago. The army of my choice was Tyranids. So I started buying and assembling a lot of models, but didn't really get into painting very much. 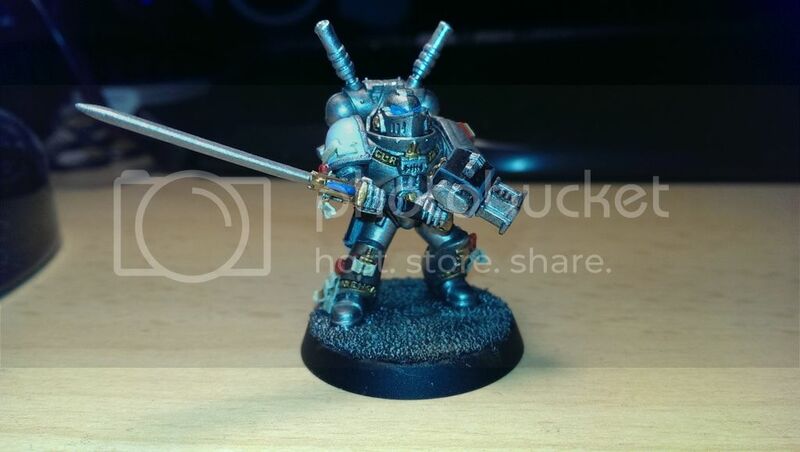 I started painting about 9-12 months into the hobby I think. So here I was, trying to make a plan on how to work on painting all those models and I started with Hormagaunts, since I have so many of them. Painting gaunt after gaunt got pretty tedious after a while and even throwing in the occasional MC didn't really help. So I did not really paint much. 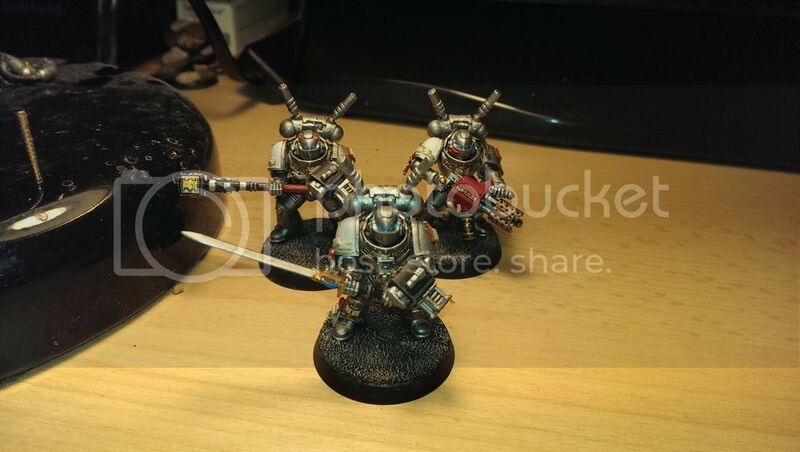 Then I found my second army, which are Grey Knights. I really like their more elite concept. But this time around I was a bit smarter. I didn't just buy lots of models, but only enough to start painting. I even magnetized every model, so that I can change weapons. I am attending my first tournament next month and still need to finish a few Interceptor for a fully painted army. My plan is as follows. After finishing the last models needed for my first tournament, I will start painting my Tyranids again, as well as additional GK models and Skitarii (dont have any models yet). I am thinking about setting myself a quota of Tyranid models I will paint, before painting something else, but I am not sure about that yet. Do you guys think that would be a good idea? Of course I am also hoping to get feedback on my models and tips on how to improve myself. I have a long way to go in painting and really hope that you guys can help keep me motivated and improve my skill in painting. Since it is getting late here in Germany and I need to work tomorrow I will post a few first pictures in the next few days. That should be all, for now. I am looking forward to everything I can learn here. And I also hope that I will not make too many language mistakes (English being my second language and all ). Last edited by Thalric on Sun Oct 25, 2015 5:43 pm, edited 19 times in total. Hello, my first language isn't english too (it's french). There aren't too many grammar nazies here, so you will be fine. From my own non expert eyes, I can say that your english is good. About your story, personnally I don't paint because I'm devoid of artistic talents and my dexterity is abysmal. But my friend paints and from what I know of him, what he does to motivate himself is to switch between different units. Instead of painting in serial similar units, he tries to switch between different projects. This week he may paint a few Thousand Sons, the next one it will be 30k Death Guards. To further escape monotony, he will put some special characters between more mundane regular units like Chaos Lord or a Dark Angel terminator sergeant. It gives him a challenge that is motivating for him. Since you have more or less 3 armies, it's possible for you to do that. As for your idea to give yourself quotas to do, it depends of your personnality. Some people may need to have an obligation of some sort for going foward with painting, but it can also backfire by making it like a rebarbative job instead of being a fun activity. If you think it will push you foward, sure do it. Your English is excellent and probably better than mine hehehe. Look forward to the first pic. as Kovlovsky suggested, I also switch between units while painting. Currently I'm painting a Droppod, a unit of Blood Claws and a Venerable Dreadnought. It keeps me motivated and prevents me from getting bored and therefore not painting at all. I'm looking forward to seeing some painted 'Nids and Grey Knights. Howdy and Welcome. It sounds like you have a lot on your plate, but I have seen/ heard worse. Also I have found people who gave English as a second lanague write it better than most people who have English as their first so don't sweat about it. thanks for the warm welcome That really motivates me to get started! Hopefully my first pictures (coming soon) will not disappoint. Either way, I am always happy about feedback and constructive criticism, that helps me learn! I guess I'll have to wait and see how my plans progress, before I make a decision concerning a quota. I'll upload my first pictures tomorrow probably. I haven't seen a function to upload pictures yet. Is there a way to upload them directly (in case I am blind), or do I have to use a third party and link them here (via Img)? A list of all the models I have to paint is also in the works atm and I'll probably edit it into the starting post. 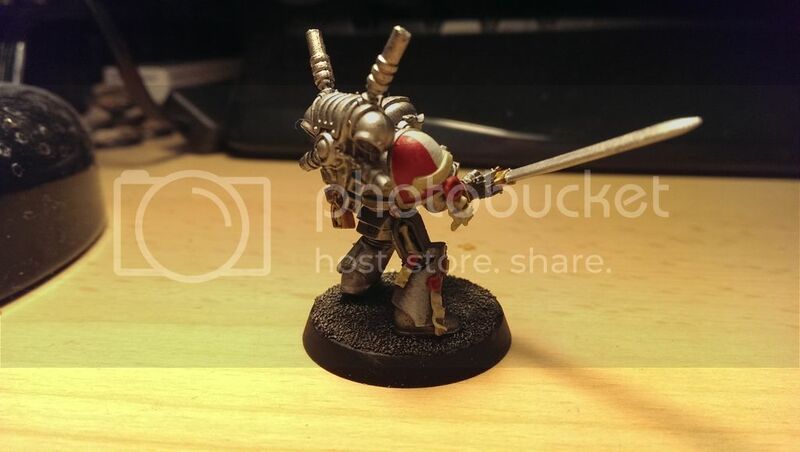 Also I am going by my local GW tonight and getting my first Skitarii models. At the moment I am undecided what color scheme I will paint them in. I like most of the ones presented in the Codex and I probably lean towards Ryza the most at the moment, because the Orange would be pretty nice in my opinion. For images, you do need to use a host like Photobucket. Myself, I'm going to do my own Forge World. I'm thinking of going with some organic browns and greens, just to contrast with all the metal. I am admittedly really drawn to the Mars color scheme with without the cream. To come full circle though, I am making them Dark Mechanicus and based loosely around the band Slayer...so I may go with heavy reds and blacks with organic bits of brown thrown in. Think Reign in Blood through South of Heaven, Larry Carroll artwork. Okay, then I'll look into that! Welcome to the Weekly Paint! Looking forward to seeing what you do! I also switch between projects - I wish I could call it a strategy but I fear it's more like ADHD lol However it does honestly help a great deal keep it all new. And as one of the ones with the overpowering awesomesauce Skaven hordes to paint, that definitely helps! I finished my latest model today, so I thought it would be time to post some pictures. Sadly, I only have my Smartphone camera so the quality isn't the best. I need to find a way to take better pictures. The only thing missing is putting some grass on the bases. I need to do that with all my Interceptor models, since I rebased them on the new 32mm bases. I will do it once I finish painting the two remaining models I need for my first tournament. I had planned to purchase a Box of Vanguards/Rangers as well, but they were sold out, so I ordered them in the shop and can pick them up on Thursday. Still not sure which color scheme I will paint them in though ^^. Well I guess that would be all for the moment. I hope you like the first few pictures! I really, really, really like these. Really!!! NICE!